I am all up for trying out new products and when it's from one of my favourite brands I'm all the more excited! Lee Stafford is a brand/guy I have shouted from the rooftops about for years and years - I'm such a lover of his stuff and each new range he brings out just seems to get better and better. I've used products from both of these ranges before, so too see new additions have me excited and intrigued! First up lets talk about the new products in the Bleach Blondes range. As you all know, I'm not a natural blonde (sorry for spoiling the illusion) and trying to maintain a good shade of pretty blonde whilst keeping my hair in good condition can take a few products. Because I have bleached hair I really do try to keep it healthy and strong especially at the ends and number one on list list is always - oils. GOLDen girl OiL is an oil said to be a 'kiss of life for bleached hair' something I desperately need after a few blow dry and straightening sessions! Before I had my hair cut into a lob the ends were so thin and straggly and I really don't want my hair to be in that condition again this time round! This oil can be used on wet or dry hair and has a lovely weightless, non-greasy formula. The scent is the classic LS scent which I love and I've been using this when my hair is damp and then again once it has air-dryed from the mid-lengths to the ends. GOLDen girl OiL hydrates thirst quenching hair, amplifies shine and helps to neutralise brassy tones - perfect for us blondies! Next up is the Tone Correcting Conditioning Spray. This actually surprised me, I've seen sprays like this before and they are normally something you spray in your hair before showering but this stuff is for afterwards - not to be washed out. Another violet toning product to help get rid of those brassy/copper tones but also a conditioning spray to keep your hair strong, soft and moistoursied. Genius! Now.... onto those Arganoil newbies! The Nourishing Miracle Mist has slowly become my favourite new hair product in my routine! It reminds me a bit of the Ubuntu Oils Repairing Mist which is used daily when I had extensions, it's light and not greasy in the slightest! It has transformed my dry, processed ends into softer and more mangeable locks. LOVE LOVE LOVE. Last but not least is the Arganoil Night Repair Serum. I love a product which can get to work while I'm getting my beauty sleep - no leaving on for 15 minutes and then rinsing out, this stuff you can pop on and just head to bed - lovely jubley! This overnight miracle treatment is a moisture infused lotion you pop on your mid-lengths to ends before bed - but don't worry this stuff is easy peasy and absorbs quickly so won't leave a nasty mark on your pillow! In fact.... I'm about to comb some through my hair right now! Leaving your hair feeling protected and regenerated this is the perfect weekly beauty treat. ive never used of their products, sounds like I should check the oil serum! 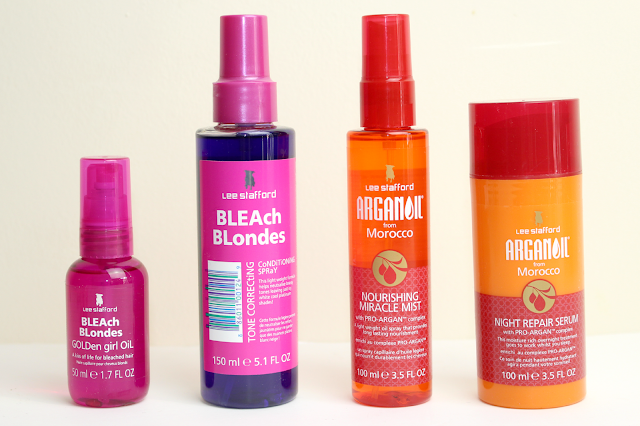 I love Lee Stafford products, the Hair Growth range is my favourite! Argan oil is mostly used as skin Moisturizer but I am using it for my hairs. Great experience with Argan oil.